Match ends, FC Schalke 04 2, VfL Wolfsburg 1. Second Half ends, FC Schalke 04 2, VfL Wolfsburg 1. Attempt saved. Ahmed Kutucu (FC Schalke 04) right footed shot from the left side of the box is saved in the bottom right corner. Assisted by Bastian Oczipka. Attempt missed. Haji Wright (FC Schalke 04) right footed shot from the centre of the box is close, but misses to the left. Assisted by Suat Serdar following a fast break. Substitution, FC Schalke 04. Suat Serdar replaces Weston McKennie. Substitution, FC Schalke 04. Haji Wright replaces Mark Uth. Attempt missed. John Brooks (VfL Wolfsburg) left footed shot from the centre of the box is close, but misses to the right. Assisted by Wout Weghorst with a cross following a corner. Corner, VfL Wolfsburg. Conceded by Bastian Oczipka. Sebastian Rudy (FC Schalke 04) wins a free kick on the left wing. Attempt blocked. Mark Uth (FC Schalke 04) right footed shot from the centre of the box is blocked. Assisted by Steven Skrzybski. Corner, FC Schalke 04. Conceded by William. Alessandro Schöpf (FC Schalke 04) wins a free kick on the right wing. Goal! FC Schalke 04 2, VfL Wolfsburg 1. Daniel Caligiuri (FC Schalke 04) left footed shot from the centre of the box to the top left corner. Assisted by Weston McKennie. Attempt saved. Alessandro Schöpf (FC Schalke 04) right footed shot from outside the box is saved in the bottom left corner. Assisted by Benjamin Stambouli. Corner, FC Schalke 04. Conceded by Jérôme Roussillon. Delay in match Renato Steffen (VfL Wolfsburg) because of an injury. Substitution, VfL Wolfsburg. Josip Brekalo replaces Elvis Rexhbecaj. Weston McKennie (FC Schalke 04) is shown the yellow card for a bad foul. Attempt missed. Wout Weghorst (VfL Wolfsburg) right footed shot from the left side of the box is close, but misses to the right. Attempt blocked. Alessandro Schöpf (FC Schalke 04) right footed shot from outside the box is blocked. Assisted by Daniel Caligiuri. Attempt blocked. Mark Uth (FC Schalke 04) left footed shot from the left side of the box is blocked. Assisted by Sebastian Rudy. Attempt missed. Daniel Caligiuri (FC Schalke 04) right footed shot from the right side of the box misses to the left. Assisted by Sebastian Rudy. Corner, VfL Wolfsburg. Conceded by Mark Uth. Corner, VfL Wolfsburg. Conceded by Weston McKennie. Attempt blocked. Renato Steffen (VfL Wolfsburg) left footed shot from the right side of the box is blocked. Assisted by Jérôme Roussillon with a cross. Attempt missed. Weston McKennie (FC Schalke 04) right footed shot from the left side of the box is close, but misses to the right. Attempt blocked. Mark Uth (FC Schalke 04) left footed shot from the left side of the six yard box is blocked. Sebastian Rudy (FC Schalke 04) hits the bar with a header from the centre of the box. Assisted by Daniel Caligiuri with a cross following a corner. Corner, FC Schalke 04. Conceded by Admir Mehmedi. Attempt saved. Mark Uth (FC Schalke 04) header from very close range is saved in the bottom right corner. Assisted by Weston McKennie with a cross. Attempt missed. Renato Steffen (VfL Wolfsburg) left footed shot from outside the box is high and wide to the left. Assisted by William following a corner. Attempt blocked. Maximilian Arnold (VfL Wolfsburg) header from the centre of the box is blocked. Assisted by Admir Mehmedi with a cross. Corner, VfL Wolfsburg. Conceded by Benjamin Stambouli. Second Half begins FC Schalke 04 1, VfL Wolfsburg 1. First Half ends, FC Schalke 04 1, VfL Wolfsburg 1. Attempt missed. Daniel Caligiuri (FC Schalke 04) left footed shot from the right side of the box is close, but misses to the right. Assisted by Alessandro Schöpf. Attempt blocked. Alessandro Schöpf (FC Schalke 04) right footed shot from outside the box is blocked. Assisted by Mark Uth. Attempt missed. Matija Nastasic (FC Schalke 04) left footed shot from the centre of the box misses to the left. Assisted by Daniel Caligiuri with a cross following a set piece situation. Attempt missed. Weston McKennie (FC Schalke 04) header from the centre of the box misses to the left. Assisted by Benjamin Stambouli. Corner, VfL Wolfsburg. Conceded by Salif Sané. Attempt missed. Daniel Caligiuri (FC Schalke 04) left footed shot from outside the box misses to the left. Attempt saved. Elvis Rexhbecaj (VfL Wolfsburg) left footed shot from outside the box is saved in the top right corner. Assisted by William. Attempt saved. Yannick Gerhardt (VfL Wolfsburg) left footed shot from the centre of the box is saved in the centre of the goal. Assisted by Admir Mehmedi with a through ball. Goal! 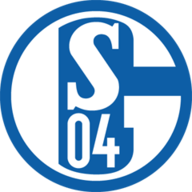 FC Schalke 04 1, VfL Wolfsburg 1. Elvis Rexhbecaj (VfL Wolfsburg) left footed shot from the centre of the box to the bottom right corner. Admir Mehmedi (VfL Wolfsburg) hits the right post with a left footed shot from the left side of the six yard box. Assisted by Renato Steffen. Attempt blocked. Admir Mehmedi (VfL Wolfsburg) right footed shot from outside the box is blocked. Hand ball by Weston McKennie (FC Schalke 04). Attempt missed. Steven Skrzybski (FC Schalke 04) right footed shot from the right side of the box misses to the left. Assisted by Mark Uth. Steven Skrzybski (FC Schalke 04) wins a free kick in the attacking half. Goal! FC Schalke 04 1, VfL Wolfsburg 0. Daniel Caligiuri (FC Schalke 04) converts the penalty with a right footed shot to the bottom left corner. Penalty FC Schalke 04. Alessandro Schöpf draws a foul in the penalty area. Attempt saved. Admir Mehmedi (VfL Wolfsburg) right footed shot from the left side of the six yard box is saved in the centre of the goal. Assisted by William with a cross. Corner, VfL Wolfsburg. Conceded by Alexander Nübel. Attempt saved. Admir Mehmedi (VfL Wolfsburg) header from the centre of the box is saved in the top right corner. Assisted by Yannick Gerhardt with a cross. Attempt blocked. Weston McKennie (FC Schalke 04) left footed shot from outside the box is blocked. Assisted by Sebastian Rudy.